‘Investigative journalists play a crucial role in exposing poor working conditions, given that employees are terrified to speak out and the topic is a taboo in the public,’ says Bettina Musiolek from Clean Clothes Campaign. 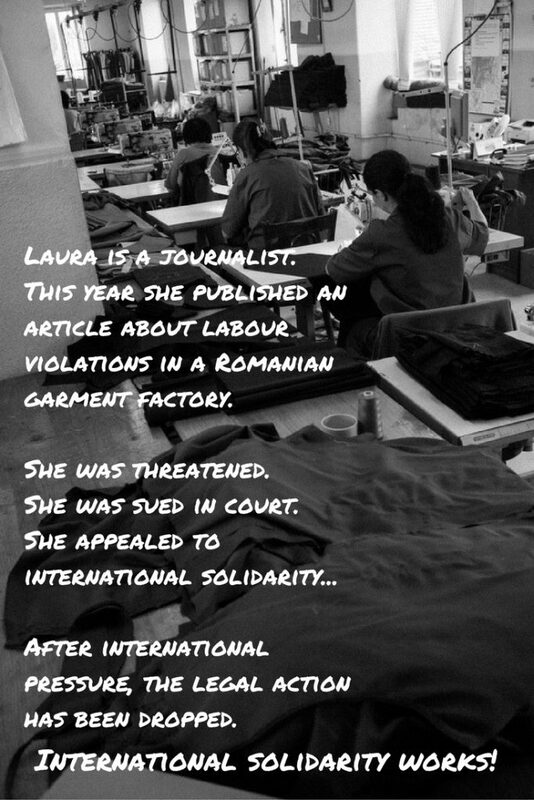 The journalist, Laura Ștefănuț, has been doing research on the garment industry in Bulgaria and Romania, exposing human and labour rights violations such as extremely low wages, long hours and arduous working conditions. She published her findings in an article released in February 2016. Since then, she has been put under enormous pressure and has been subjected to attempts of intimidation. This culminated in the lawsuit filed against her by Maglierie Cristian Impex, one of the factories cited in her article. Maglierie accused Laura Ștefănuț of scaring away its clients with her article, causing a loss of orders. The factory filed a damage case of 45,000 euros against her and the local newspaper which re-published her article. Laura Ștefănuț remarks: ‘If the pressure on a journalist is already so intense, imagine what the workers face. I showed that employees can be fired for demanding their rights, but the entire pressure they face is difficult to grasp for an outsider. During the years of documenting vulnerable groups, I have never seen so many people terrified of speaking, as in the garment industry’. She recounted her own experiences with the intimidation, lawsuit and the following international campaign on her behalf in an article published in November 2016.